"I think the two options are bad for the Israelis. Both of them are bad. 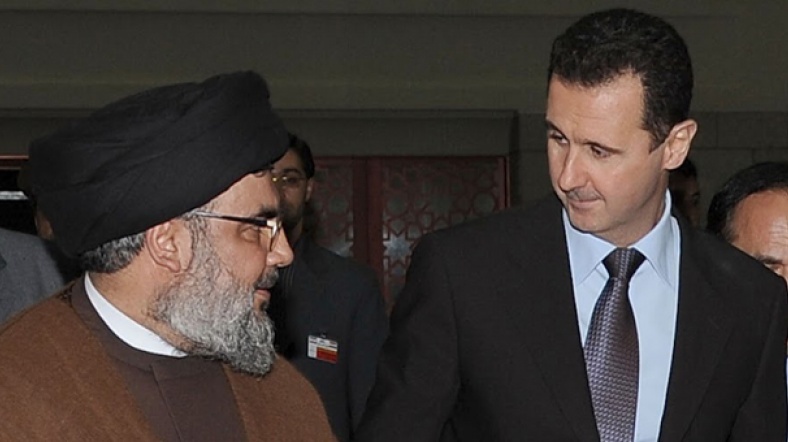 Sayyed Hasan Nasrallah has repeatedly talked about Syria’s relationship with the resistance and a Syrian role in the resistance. So, how would the Israelis choose between two bad things for them?" President Assad's Al-Alam TV Interview, June 13, 2018. "There are different forms of this resistance which appeared a few years ago. In the beginning they were fighting ISIS before they started to fight the occupiers. They were against ISIS in the central and eastern regions, and there were cases where they appeared in other regions which were not given media coverage and about which we hear sometimes through information and indications. Now, this situation has started to expand. So, it’s not one single case. There are a number of cases which might be individual sometimes, or in the form of small groups not affiliated to an organization. In any case, our position as a state has been from the beginning to support any act of resistance, whether against terrorists or against occupying forces, regardless of their nationality, i.e. American, French, Turkish, or Israeli. We support these resistance forces based on our national role as a government." "The ongoing decades-long scheme against the Arab Nation has ever been as to consecrate the concepts of submission and surrender and to eliminate the Resistance principle. The existence of the Arab Youth, like you: Arab and Resistance Youth, is a proof about the vitality of the Arab Nation and a clear-cut proof for the failure of the enemies' schemes, and their failure persist as long the torch of Resistance is glittering alive in the conscience and spirits of the Arab Youth of whom you represent an important part,"
H.E. President Bashar Al-Assad receiving a youth delegation participating in the 2nd Resistant Arab Youth Camp, August 28, 2017. "It is your duty and responsibility today ,given the standing challenges, to think about how to change reality and build the future. Such a change involves genuine active involvement in the work on the ground, and not through wishes nor through isolation from reality. You have to transfer the dialogue and discussion and activate them in your countries and in your organizations; hence dialogue and discussion are the bases for every development and for your power as youth. The courage as to present and ask about any issue, whatever critical it might be, is to erase every possibility for the enemies penetrations among us." "Nasrallah is absolutely honest, transparent, principled, and loyal to his principles and his associates and friends to the extreme." "the Resistance has been efficient and qualitative part along the army in the achievements in more than a place in Syria; we are thankful for their courage," added H.E. President Al-Assad. "The Axis of the Resistance has been well established at the international arena and none whoever can ignore it,"
From H. E. President Al-Assad May 19, 2015 statements. From H.E. President Al-Assad- 2014 Inauguration Speech, July 16, 2014. From H.E. President Al-Assad interview with Lebanese Al-Akhbar in June 2014. "he requirement at that time was to use Syria against Iran and Hezbollah, and to pull it away from supporting resistance organisations in the region. This French policy failed, because its goal was blatantly obvious." From H.E. President Bashar al-Assad’s interview with Agence France Presse AFP 20-01-2014. "the Resistance in the Golan is a popular decision and emerges once the State is to renounce the policy of liberating the land." From H.E. President Al-Assad’s interview with Al-Mayadeen TV, October 21,2013. "if Hamas were to be resistance, we are with it; if it decided to be Moslem Brotherhood, there is no need for relation with it." "the ongoing against Syria is but to hit the axis of resistance in the region as to transform resistance into enemy as well as into a sectarian project in the interest of Israel." From H.E. President Al-Assad's Interview with al-Thawra Newspaper, July 4,2013.
" They have used all methods in this region: direct and indirect occupation, threats, intimidation, as well attempts to breach our national security and culture. They have tried everything and Syria continues to be a source of hindrance to their objectives. Recent events in Arab countries were seen as an opportunity to strike Syria and undermine and weaken the axis of resistance in the region. The core of their objective now is redefine who is an enemy and who is an ally; Israel becomes the invisible enemy, even an ally for some, whilst the resistance becomes the enemy. Instead of representing a movement and an actor against Israeli occupation, the attempt is to project the resistance as the enemy, transforming it from a resistance movement to sectarian movement. This has not transpired and will not transpire. The Syrian people are not so easily misled or fooled. For us, the resistance and all our allies, our aims are clear and our route well defined. Regardless of what they propagate, we will achieve our goals in terms of our resistance and our internal wellbeing. We shall do this in our own way and without hesitation. Regardless of what they say, we will always act according to what is best for Syria." " Precisely, that’s because it has a bearing both on the internal crisis in Syria and on the resistance since it is a border town which is the back garden of the resistance. The resistance cannot be strong without an element of strategic depth to it, which is in Syria. Thus the area bears geo-strategic importance in the connection between Syria and Lebanon and specifically the resistance. That is the fundamental reason why the resistance had to join the battle because it affects them as much as it affects Syria. Their involvement was necessary and we were completely transparent about this. We will not hesitate to do it again or shy away from it. However, if we needed the resistance as they tried to portray, why did we need it in Al-Qseir but not in Damascus, Aleppo or other key areas? We have a strong army that is supported by large number of National Defence Forces." "Syria, as it has been and even more, would ever stand by Resistance and men of Resistance in every place of the Arab World,"
From H.E. President Bashar Al-Assad ‘s Interview with Al-Manar TV,May 30,2013. "A state which stands against the resistance is but a reckless one"
"there is clear popular pressure to open the Golan front to resistance." "Real change in the rules of engagement happens when there is a popular condition pushing for resistance." "The real change is when the people move towards resistance; this is the really dramatic change." "A state does not create resistance. Resistance can only be called so, when it is popular and spontaneous, it cannot be created. The state can either support or oppose the resistance, - or create obstacles, as is the case with some Arab countries. I believe that a state that opposes the will of its people for resistance is reckless. The issue is not that Syria has decided, after 40 years, to move in this direction. The public’s state of mind is that our National Army is carrying out its duties to protect and liberate our land. Had there not been an army, as was the situation in Lebanon when the army and the state were divided during the civil war, there would have been resistance a long time ago." "We have absolute confidence in our victory, and I assure them that Syria will always remain, even more so than before, supportive of the resistance and resistance fighters everywhere in the Arab world." "The circumstances have changed, and these circumstances showed Erdogan’s reality. I’ll give you some evidence. For example, we heard a lot of shouting in defense of the Palestinians in 2008 when Israel attacked Gaza. But two and a half years before that, we did not hear that kind of shouting when Israel attacked Lebanon. The resistance was there in both cases, and Israel killed in both cases, and in both countries the number of martyrs was approximately 1500." From H.E. President Bashar Al-Assad's Cumhuriyet Interview , July 3, 2012. "proper analysts for what is going on in the region shows that there is a conflict between two projects: the resistance project which rejects hegemony, and the Greater Middle East project, adding that this conflict is not new but as old as colonialism; it was just given a new name." From President Bashar Al-Assad's Interview with Iranian TV, June 28, 2012.
" Syria is paying the price for its political positions in supporting the resistance and adhering to the Arab and Islamic rights." " supporting the resistance in Palestine and other areas will continue as long as the people don't relinquish this support, stressing that Syria has mainly built its policy on the national and popular compass, and not the foreign or Western one." "When resistance men carry arms, do they do so because they like blood? Did the Prophet (peace be upon him) wage his wars for the love of blood or in defense of a message? The same applies to the wars of al-Rashidoon. Today we are defending a cause and a homeland. We are not doing what we are doing because we love blood. A battle has been forced on us, and the result was the blood which has been spilled. Some people might say we wish the blood was shed on the national borders and on the frontlines. This is true, but the enemy is now inside and is no longer on the borders. The enemy has changed its methods and tactics." From the Speech Delivered by H.E. President Bashar al-Assad At the People's Assembly, June 4, 2012. "They didn't understand that the issue isn't about reform and democracy, as was suggested in the beginning, but about Syria's resistant role and its support of resistance and its upholding its rights." "I tell them that my colour is that of this people which encompasses the spectrum of sovereignty, resistance, dignity and love." "When negotiations- peace negotiations- have failed for two decades now, the option will be resistance. Resistance is the parallel path to the restoration of the rights. Resistance doesn't contradict peace, it will lead to peace. The result will be the restoration of the lands and the rights, and then peace will be definitely achieved in our region." "We do not trust the Israelis and we don't believe that they want peace. Therefore, we say that the other means to liberate the land is the resistance." "No one looks for war, even the resistance in the Arab world. Peace is the goal. Resistance existed because of the absence of peace so we must strive towards peace as long as there is hope." "You say we might have hope in the Israeli government. The answer is no; But we believe that Israel today has no option but to accept the peace. Israel's deterrence power eroded with time. The more the Israeli military force increase, the more the awareness of resistance and deterrence concepts in the Arab street increases." "Resistance is not made by state decision. It is a natural choice of the nations when the state doesn’t work to liberate the land"
"So when you don't accept the peace terms, you have to expect resistance." "We haven't achieved peace yet and the Israelis never delivered since the beginning of the peace process in 1991,"
"Syria's political discourse did not change, and will not change until Israel's occupation changes," ; "The issue is very clear; we don't see any interest in abandoning the Resistance. Moreover, our position towards the Resistance is fix and solid. It never changed,"
"The Lebanese Resistance is far more powerful today and especially from a popular aspect. I am not talking about the military aspect, the popular. The power of the Resistance stems from its popular support, which is more inside and outside Lebanon, as we witnessed last year during the Israeli aggression of July against Lebanon…. The Arab people in general support every resistance. Syria’s position stems from the position of the Syrian Arab People. Our support for the Resistance is a political one linked to our causes. The Resistance in Iraq has its finance and weapons; they have every thing, and need no military support from any side, neither from Syria, Iran, nor from others."